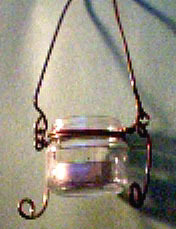 You can use inexpensive copper wire and babyfood jars to create hanging candleholders. Leftover copper electrical wiring was used for the candleholder at the by removing the plastic sheath and taking just the wires out. You can do this by cutting down the length of the wire with a craft knife and peeling back the plastic. This isn't easy and should be done carefully by an adult. 1. Paint your jar. A thin coat of spray paint on the outside works well, less streaking shows when the candle is lit. Or you can use paint made for glass and paint small designs on the outside of your jar. You could even decoupage tissue paper squares to the outside. If you can get all the glue from the label off, they look nice left plain too. 2. If you are using thin wire, cut about 4 - 6 wires the same length (about 1 - 2 ft., depending on the size of your jar and how elaborate a design you want). Divide your cut lengths in half and center wires on each side of jar just under the lip, then bend around jar and twist them together tightly to hold the jar. 3. Using needlenose pliers bend two groups of wires up and two groups down. At the top twist them together and make a loop to hang it. At the bottom, twist them together tightly under the jar to help hold the jar in place. With the leftover length at the bottom, you can use needlenose pliers to twist the wire into curly-cue designs, if the wire is thin enough you can string beads on it. 4. Place a tea light inside and light. This was made using much thicker copper wire purchased at the hardware store for about 14 cents a foot. This wire was quite hard to bend when trying to make small loops.